A spirit of unity swept the National Football League on Sunday as rival teams, players, coaches and even some owners and performers took a knee or linked arms — or even refused to take the field — to show opposition to President Donald Trump and support for the movement started by ex-quarterback Colin Kaepernick. Trump fired the first shot of the morning, with tweets that called for NFL fans to boycott the league — an attempt to pressure team owners to discipline players who protest American racial and social issues during the national anthem. 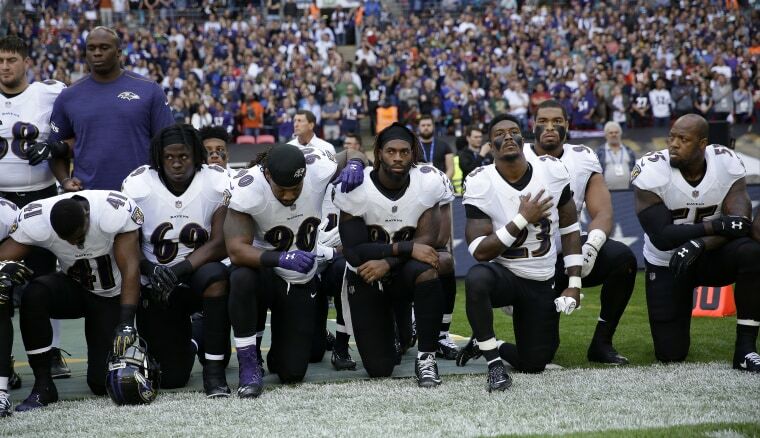 Hours later, as the "Star Spangled Banner" played at London's Wembley Stadium, nearly all the players on the Jacksonville Jaguars and Baltimore Ravens — joined by Jags owner Shad Khan and former Ravens star Ray Lewis — either locked arms in a show of unity, or knelt like Colin Kaepernick as they joined a growing wave of sports stars to publicly defy the president. The match was the first in the NFL's series of international games, which is why kickoff was at 9:30 a.m. ET. Players on many teams knelt or linked arms in a show of solidarity with each other and opposition to Trump's divisive comments. The Pittsburgh Steelers went a step further, announcing ahead of their match-up with the Chicago Bears that they would not leave their locker room for the national anthem — and they made good on that promise. The Seattle Seahawks players released a joint statement on Sunday explaining that they also would not participate in the national anthem. "We will not stand for the injustice that has plagued people of color in this country," the statement said. "Out of love for our country and in honor of the sacrifices made on our behalf, we unite to oppose those that would deny our basic freedoms." The Titans, the team the Seahawks played Sunday, also shared their intentions to remain in their locker room during the anthem. But the president remained focused on the kneeling versus linked arm divide. According to Trump, linked arms were OK — kneeling was not. The NFL dismissed Trump's tweets and his proposed boycott. Brian McCarthy, the NFL's vice president of communications, told NBC News that they enjoyed a series of "fantastic games" on Sunday and they expected "good ratings" and had boasted large crowds. "What you saw today was a demonstration of unity across the game from the players and coaches," McCarthy said. "Each team, in their own way, demonstrated unity — and it was a great day of football." The NFL, according to McCarthy, would not pursue fines or disciplinary actions because of the on-field protests. Yet the opposition to the president's statements did not just occur on the field. Owners and executives from nearly 20 sports teams — representing football, basketball and even baseball organizations — declared support for players, called for unity and emphasized freedom of speech and expression in a series of statements. Trump reportedly put in a $1 billion bid for the Buffalo Bills in 2014, and declared he would be the only buyer who would keep the team in Buffalo or produce a winning team, but he was beat by the Pegulas. I am the only potential owner of the @buffalobills who will keep the team in Buffalo, where it belongs! Rex Ryan, former head coach of the Buffalo Bills, said that he supported Trump during the election — even introducing him at a rally in Buffalo. But now, Ryan said he was “pi--ed off” and appalled by the president’s comments. New England Patriots Chairman and CEO Robert Kraft, who is also a longtime friend of Trump’s, said that he was “deeply disappointed” by the president’s comments on Friday. He said he was proud to be associated with the players who help build communities and relationships between people. At the New England Patriots game against the Houston Texans, quarterback Tom Brady linked arms with his teammates. And in an unprecedented move, the very singer of the national anthem at the Detroit Lions-Atlanta Falcons game, Rico Lavelle, took a knee and raised a fist when he concluded the anthem. Meanwhile, Trump took the opportunity to retweet two memes: one called for the boycott of the NFL, the other depicted an amputee serviceman that focused on his physical inability to stand on his "OWN" legs. Later, as he boarded a plane back to Washington, Trump made quick remarks again on the issue, saying "I think the owners should do something about it, I think it's very disrespectful to our flag and our country." The issue of players refusing to stand during the national anthem has been criticized in the past by several people and groups. Kaepernick started the trend last year when he played for the San Francisco 49ers, in a year that was marked by protests over police shootings of African-Americans. Kaepernick, who took the Niners to the Super Bowl in 2013, remains an unsigned free agent amid the controversy. Trump thrust the issue back into the spotlight at a rally on Friday night. In a freewheeling speech in Alabama, the president told the crowd, "Wouldn't you love to see one of these NFL owners, when somebody disrespects our flag, to say, 'Get that son of a b---h off the field right now. Out! He's fired.'" The comments, along with Trump's withdrawal of an invitation to the White House for the NBA champion Golden State Warriors, sparked a backlash from some of the biggest names in professional sports.